One of the most challenging things to see as one begins to give up who one "thinks" they are and begins to see that what they had "thought" does not actually exists; is to discover that the "I" thought ... isn't. Because it is so "absolutely" assumed to be true; that one consistently overlooks that it isn't. 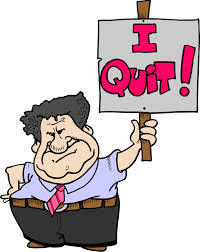 The saying above "I Quit!" is a pretty funny statement, because unless one investigates "who" will quit, the next thought that appears is where will "I" go ... if "I" quit. If one investigates the first fully, then the later doesn't arise. "Giving Up" is the solution, you look for the "I" and when you don't find it, you Give Up, you don't go making a new "I" or a better "I" or a worse "I," you just begin to live without one. Give up attempting to figure out "how" you are not ... to "see" that you are not. If this was a simple task, there would be no such thing as a spiritual search or getting to know God or being saved by Jesus or enlightened by Buddha. It takes courage to continue to look when the entire mechanism of the world is to keep you from the discovery. However, as you begin to investigate, the world begins to shift from one of hiding to one of revealing. "﻿There is no "I" in You.﻿"